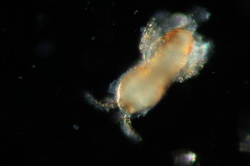 Infestations from the 'red bug' Tegastes acroporanus is often referred to as a disease/syndrome in most of the grey literature. 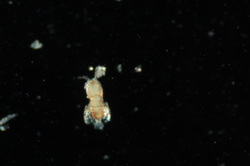 T. acroporanus is a predatory micro-crustacean which is specific to acroporids, they are small, ca. 0.5 mm in length and yellow in colour with a distinctive red dot which gives this species its common name. Poor polyp extension, loss of colouration and overall decline in health have been reported as signs of infection. Infestations of T. acroporanus have so far not been recorded in the wild to date, although would be easily overlooked due to their size. A treatment of red bug disease caused by T. acroporanus, first developed by Dorton (2010), is the use of Milbemycin oxime, an active ingredient in heart worm medication for dogs called “Interceptor” within the USA or in a product called ‘Milbemax’ in the UK (where M. oxime is mixed with Praziquantal). 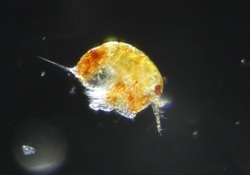 This is an indiscriminate drug which kills all crustaceans as well as T. acroporanus, so would not be a feasible treatment of wild diseases or aquaria with mixed communities including crustaceans (crabs, lobsters, shrimp). An attractive option to this treatment is the introduction of a biological control, the dragonface pipefish, Corythoichthys haematopterus for example. These fish are known to anchor themselves to Acroporids and feed on crustaceans including T. acroporanus. It is also common that secondary infections often follow, initiating from the feeding scars caused by T. acroporanus, along with the scars left by nudibranchs, Drupella and/or other corallivorous snails.